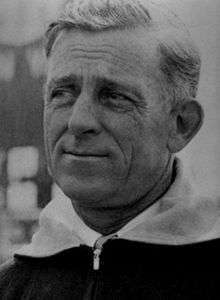 Charles Emile "Gus" Dorais (July 2, 1891 – January 3, 1954) was an American football player and coach of football, basketball, and baseball. Dorais played college football at the University of Notre Dame, where he was an All-American in 1913 at quarterback, and then played professionally with the Fort Wayne Friars and Massillon Tigers. Dorais was the head coach at Columbia College (1914–1917) in Dubuque, Iowa, Gonzaga University (1920–1924) in Spokane, Washington, and the University of Detroit (1925–1942), compiling a career college football coaching record of 150–70–12 (.672). He was also the head coach of the National Football League's Detroit Lions from 1943 to 1947, tallying a mark of 20–31–2 (.396). In addition, he was the head basketball coach at Notre Dame, Gonzaga, and Detroit and the head baseball coach at Notre Dame and Gonzaga. Dorais was inducted into the College Football Hall of Fame as a coach in 1954. Born and raised in Chippewa Falls, Wisconsin, Dorais arrived at the University of Notre Dame in South Bend, Indiana in the summer of 1910 at 5 ft 7 in (1.70 m) and 145 lb (66 kg). He started four seasons for the Fighting Irish at quarterback, but it was during his senior season that he became part of college football history. During the summer of 1913, Dorais and his Notre Dame teammate Knute Rockne worked as lifeguards and busboys at Cedar Point Resort at Lake Erie in Sandusky, Ohio. During their free time there, the story goes, the duo practiced passing on the beach with Dorais throwing to Rockne, an end. "We mastered the technique of losing the football with hands relaxed and tried to master the more difficult feat of catching it with one hand," Rockne later wrote. The Irish, 17–1–3 (.881) in Dorais' first three seasons as a starter, outscored their first three opponents in 1913 by a margin of 169–7. On November 1, 1913, the Irish, still known mainly in the Midwest at the time despite just one loss in three seasons, traveled to West Point, New York with a roster size of only eighteen players to face heavily favored Army. Although Dorais and Rockne are often credited with inventing the forward pass that day against the Cadets, the maneuver had been legal since 1906, and had been used by several lower-profile programs. In 1952, Dorais himself tried to set the record straight, telling the United Press that "Eddie Cochems of the St. Louis University team of 1906-07-08 deserves the full credit." Dorais first completed a pass to Rockne two seasons before. But against Army in 1913, Dorais, an Irish co-captain and the first Irish player named a consensus All-American, completed 14 of 17 passes for 243 yards and three touchdowns. At the time, his 40-yard pass to Rockne was the longest pass ever completed. After taking a 14–13 halftime lead, Notre Dame pulled away from a confused Army team for a 35–13 victory that changed the landscape of college football and lifted the Irish out of obscurity. From that point forward, no longer was the forward pass an obscure weapon, or a little-used gimmick to be used when trailing late in games. "The press and the football public hailed this new game, and Notre Dame received credit as the originator of a style of play that we simply systematized," Rockne said. In addition to playing quarterback, Dorais was also the team's placekicker. Dorais and Rockne were roommates at Notre Dame, and in their coaching days, Dorais served as an assistant for a season under Rockne. Dorais served as head coach at Columbia College from 1914 to 1917, then was an assistant to Rockne at Notre Dame in 1919. He went west to Spokane in 1920 to become head coach at Gonzaga University for five years, through the 1924 season. He also was the head coach of the basketball and baseball teams through their 1925 seasons, and also track. Dorais earned $4,000 per year at Gonzaga and was kept for a fifth season in 1924 when boosters helped raise his salary to $7,000 to prevent him from leaving for Detroit. The Bulldogs were undefeated in 1924, led on the field by Houston Stockton, grandfather of basketball hall of famer John Stockton. Although offered $8,000 to stay in Spokane at Gonzaga in 1925, Dorais resigned that February and left for the University of Detroit where he was the head coach for 18 seasons (1925–1942). His record with the Titans was 113–48–7 (.693). Dorais was also the head coach of the basketball team for his first four years at the school (1925–1929). Due to World War II, Detroit did not field a football team during the 1943 and 1944 seasons. Dorais was the college team coach for the College All-Star Game in August 1937 in Chicago, in which college seniors played against the defending NFL champions in a pre-season game. With Sammy Baugh at quarterback, the college stars won 6–0 over the Green Bay Packers under head coach Curly Lambeau. This was the first All-Star team to beat the pros, who also won the following year (over the Washington Redskins, quarterbacked by Baugh). As most college football teams went on hiatus after 1942, Dorais moved up to the professional ranks. He was the head coach of the Detroit Lions of the NFL for five seasons, from 1943 to 1947. Dorais retired after the 1947 season at age 56, but coached in 1952 as the backfield coach for the Pittsburgh Steelers under head coach Joe Bach. Dorais had a circulatory disorder and died at his home in Michigan in January 1954 at age 62. 1 2 3 4 5 6 "Gus Dorais, father of forward pass, dies". Spokesman-Review. Associated Press. January 4, 1954. p. 9. ↑ Smith, Floyd L. (January 20, 1924). "Gus Dorais spurns fat offers and signs contract to coach Gonzaga teams another year". Spokesman-Review. p. 1. ↑ "Friends shocked; laud ex-Gonzagan". Spokesman-Review. January 4, 1954. p. 9. ↑ "Dorais quits at Gonzaga". Spokane Daily Chronicle. February 4, 1925. p. 1. ↑ "All-time coaching records" (PDF). Detroit Titans basketball. media guide. 2013–14. ↑ "Former Gonzaga football coach taken by death". Spokane Daily Chronicle. Associated Press. January 4, 1954. p. 4. T Harvey Rexford Hitchcock, Jr.